This property is 2 minutes walk from the beach. 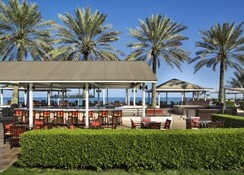 Set against a backdrop of the Hajar Mountains, this 5-star hotel offers a private beach and an outdoor pool. All rooms have a garden or sea view.The luxurious rooms and chalets at Hilton Fujairah Resort come with an ergonomic work area and satellite TV. Guests can take time off in the easy chair or refresh in the marble bathroom. Featuring balconies with garden or ocean views, the sophisticated rooms have flat-screen TVs, free Wi-Fi, minifridges and marble bathrooms. The 2-bedroom suites add separate living rooms, dining areas and sofabeds; some have private patios. 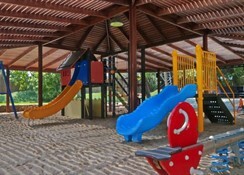 Amenities include an outdoor pool, a fitness room, a playground and a game room. There's a stylish, international restaurant and a British pub, as well as 2 bars. 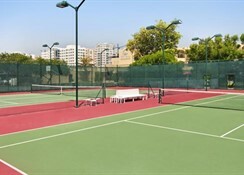 Activities include tennis, kayaking and fishing (fees may apply), and massage services are also offered. Parking is free. 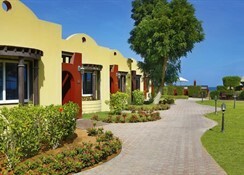 This upscale beachfront hotel is 2 km from Fujairah Heritage Village and 4 km from Fujairah Museum.